Welcome to Lazzat Photography Vendor Spotlight. The idea behind the Lazzat Photography Vendor Spotlight program is to introduce local Pensacola wedding vendors, share their stories and insight with all our engaged brides and grooms. Every two weeks we will be publishing a new Vendor Spotlight so make sure to check our website regularly to see which vendors we have had the honor to interview and highlight. 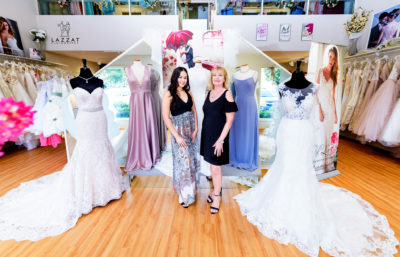 We’re opening our very first Vendor Spotlight with The Bridal Loft, a Pensacola bridal salon, dedicated to providing exquisite designer fashions for brides and their bridal party, debutantes, prom and formal gowns. 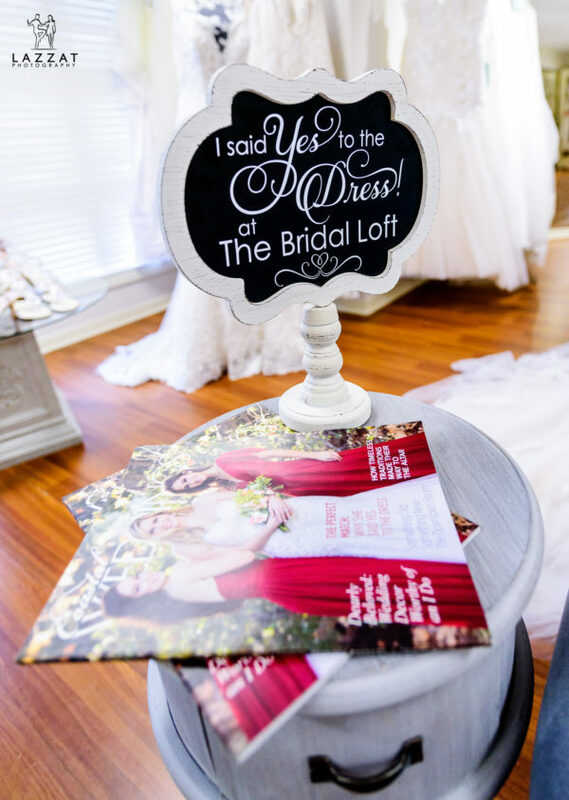 – (Lazzat) We’re opening our very first Vendor Spotlight with the Bridal Loft with Ms. Brenda and Ms. Brandi. So let’s talk about your salon and how did it all start. (The Bridal Loft) We welcome you to our neighborhood and we appreciate being the first vendor in your podcast. It all started in 2004 when we opened the store as a Ladies Boutique. By 2007 an owner of a local bridal store, which was here for 45 years, said we needed to open a bridal store. She actually took me to the bridal market and introduced to some of the bridal lines in Atlanta. And that’s where it all started. Then along came Ms. Brandi, who was still in high school in 2010. – What do you like the most about working in the wedding industry? The most fun part is the relationships we build. There are so many brides that we meet as bridesmaids, and then they come back the very next year as brides. It is a once-in-a-lifetime event and we are a part of that planning, so it is very intimate and personal. 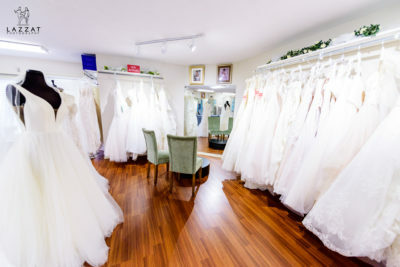 – When a bride comes to the bridal salon, she is looking for a perfect wedding gown. What kind of experience do you offer for her? One of the first questions we ask is if this is the first time she is trying on the dresses. Some brides come and say they don’t want ball gowns, or to have a fitted dress. If they have an idea what type of dress they want then that’s what we show them. 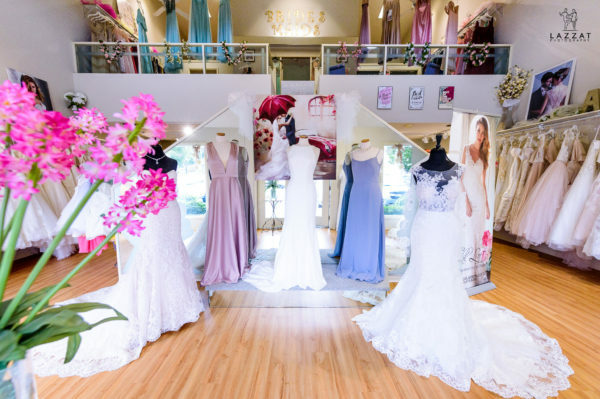 If they are completely open-minded, we encourage them to try on different styles, and when they find the silhouette they like, we recommend them to stick with that silhouette, and then find their perfect gown. – Do you have favorite dress designers? It’s hard to say which one is our favorite, because the three designers we have, we absolutely love and stand behind them 150%. They are so great to work with! I think as the seasons go by Ms. Brenda will absolutely love this dress from Stella York, while I love the dress from Pronovias. So our favorite designers change with seasons. But all of them are fantastic. – Do you allow a bride try on different accessories like a veil, jewelry, and shoes with her wedding gown or does she have to bring her own? No, we have all of them in-house. We want the bride in a dress to look at herself in the mirror and say “oh my God, YES! This is MY DRESS”, then we complete the look. – Do you offer alterations? Is it in-house or do you refer them to someone else? We do have an in-house alterations services. But if a bride has her own seamstress, then, of course, she may take the dress. The reason why we like working with our designers is if a bride is 5’2 but the dress she loves is cut for brides 5’8, then we order the dress in bride’s length, this way the bride can save on alterations, as it is included in the cost of the gown. – What about bustling the dress? We always ask our brides to come with a maid of honor or their mom to the final fitting so we can briefly show them how to do the bustle. A lot of the times girls say if they can take a video of that and we let them do that. – What about bridesmaids and mother-in-law mother of groom dresses? Our bridesmaids’ dresses come in all sizes and colors. We also offer a petite length which is also included in the cost. Moms usually wait until everybody else has done and they usually shop at the month of the wedding. We have lots of styles for them to try on, and we can get a dress for them in a week. They are not pricey and not your typical mother-of-the-bride look. We have a lot of young moms and they want something more classy, something they can wear again and sometimes they choose one of the bridesmaids’ dresses. – What about the price ranges of your wedding gowns? The majority of our gowns range from $999 to $1500. And we have a few that will range up to 2,500. But for the most part, most of our Brides spend between 1100 + 1500. – Do they need to pay the full amount in advance? We take 50% down and once the dress arrives we send them a text, they come for a fitting and that’s when they pay the remaining balance. – Do you offer payment plans? We do if they would like to make monthly payments but we need to have 50% down in order to order the dress. – Planning a wedding can get expensive. Speaking of budget, we always ask the brides to share their budget with us so we can find you something within their budget, and they won’t fall in love with something that they can’t get. We can always find you something no matter what your budget is. We always have a sample sale going on throughout the entire year. 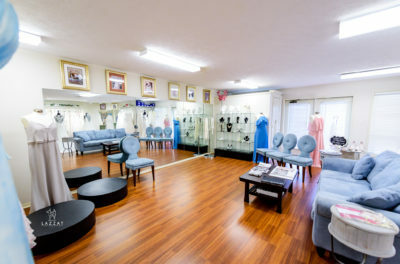 We have gowns that are 30% to 50% off, where you can buy off the rack and get a great deal on it and stay within budget. When you buy a gown off the rack we clean those gowns. They will be steamed and altered and ready for the bride to pick it up. – Any fun fact about your store? I think we are fun! We want our brides to have a very memorable experience, we don’t like it to be just business. We ask them lots of questions, chat with the bride’s sisters and mom, ask about their wedding venue or vendors. We have been doing the bridal shows here for 15 years so we do know so many of the vendors. We started doing Say Yes to the Dress experience probably a year ago just so we can have memories of our brides in pictures. Then we started slowly posting them and all of a sudden as brides come in they would say ” ohhh, do we get to take our picture with the sign?”, and it became this big thing. Pensacola being small it is fun that way because we know each other, it’s a nice small community but it’s big enough. When a bride says Yes to the Dress there are cheers, it’s a really fun time and everybody’s happy. We celebrate the bride’s big decision. And a lot of the times it’s the first thing the brides do is pick the dress first, sometimes they may not even have a wedding date but they are picking their wedding dress already. Brides often tell us when they find a dress then everything else starts moving along. 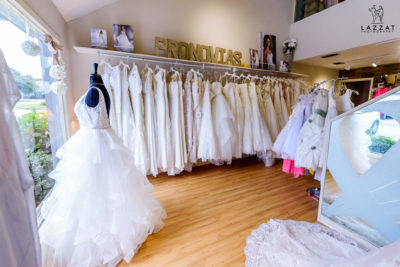 And it is also important to choose the dress that fits the venue’s style and based on the dress you pick your theme, bridesmaids dresses, and it all starts from what the bride is going to wear. 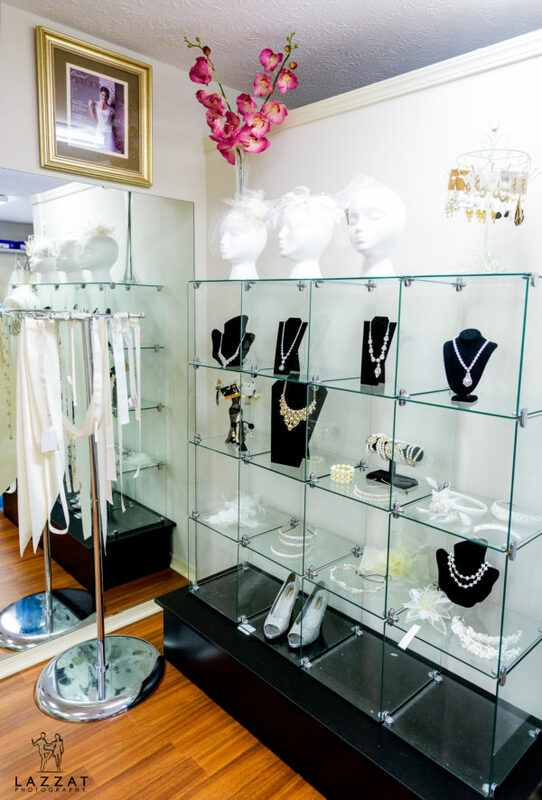 What we strive to do is that we would like it to be an intimate and exclusive experience, so we do recommend having an appointment because for all of us it becomes a private shopping experience. We want to give a huge Thank You to Ms. Brenda and Ms. Brandi from The Bridal Loft for being our first Vendor Spotlight and Rising Sun Video Productions for the awesome video! Make sure to stop by the Bridal Loft on July 21 for the start of National Bride’s week! The Bridal Loft will be extending their hours for this event and doors will open at 8am. Plus we will be there to take those exciting “Say Yes to the Dress” moments!! We can’t wait to meet you!